DeskivusTM are available exclusively from Creative Labworks, Inc.
copyright 2008-2012 Creative Labworks, Inc. When you have been disappointed by those around you, is there any other way to Air those Grievances than with the Official Airing of Grievance Sticky Note? This packet contains 3 pads of the Official Airing of Grievance Sticky Notes. (the same notes that ship with each Deskivus) This is a replacement Package for those that have alot to say. 3" x 4"; each sheet is imprinted with the text "Airing of Grievance Notes" (oh how you have disappointed me...)" as well as listing the Deskivus website and boasting a Deskivus Pole down the left side for FLAIR. Makes a Great Gift with or without a Deskivus Pole. Whether you choose to celebrate Festivus with the Deskivus(TM) Minimus, or you choose the slightly more polished Deluxe Deskivus(TM), (the product that we call the Deskivus(TM) Maximus) to adorn your cubicle, your coworkers will appreciate your Festivus holiday spirit. The Deskivus(TM) Cubivus Sticky Notes with a Festivus Flare!!! Immediately transform any desk or cubicle into "Festivus Party Central". With this Useful Cube of Deskivus Sticky Notes, you can Celebrate Festivus with each sheet you use. You will be spreading your Festivus Cheer to all who see your notes. Prepare to be popular, and share your Festivus Spirit with this delightful, useful Deskivus Accessory. This Cube is 3" x 3" x 3", each sheet of paper is imprinted with "Celebrating Festivus (the holiday for the rest of us). 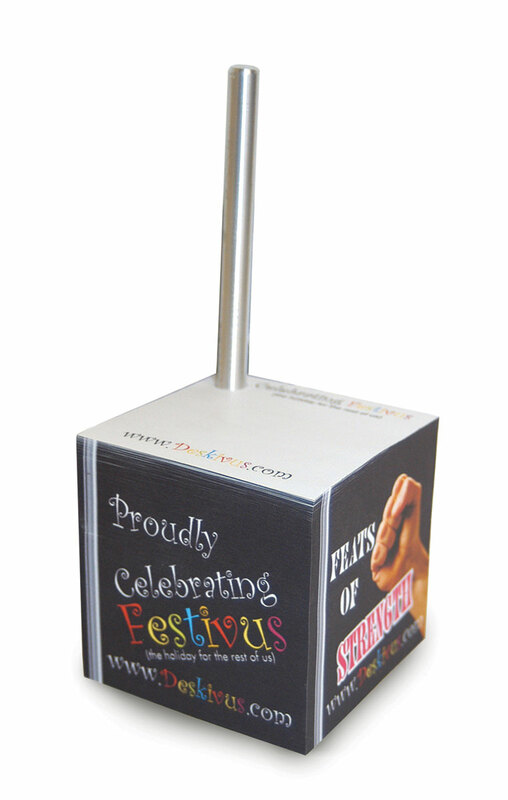 Your Deskivus Pole (mini Festivus-for-the-Desk) will always be easily visible, your coworkers will be jealous. 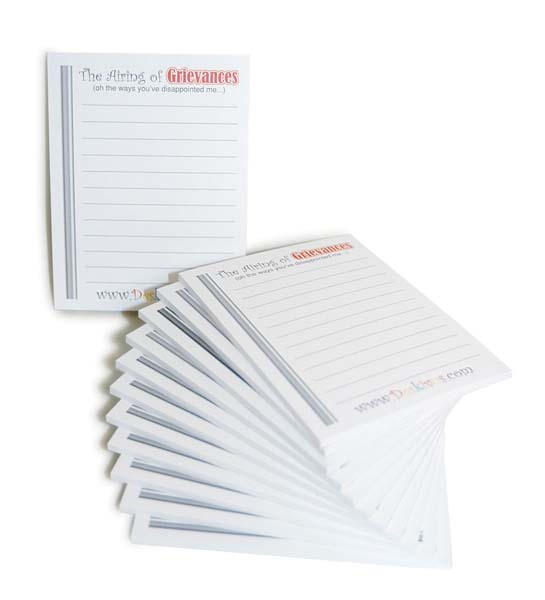 Makes a Great Gift for True Festivus Fans, and work-a-holics. Each Deskivus(TM) comes with a 12 page booklet that explains Festivus as we know it, as well as define it's True origins. A pack of Airing of Grievance sticky notes is also included to assist you in sharing all your disappointments with those you know and love. This packet contains 12 pads of the Official Airing of Grievance Sticky Notes. (the same notes that ship with each Deskivus) This is a replacement Package for those that REALLY HAVE ALOT TO SAY. This package is designed as a Gift Pack - with 12 pads, there are plenty to share at your next Festivus Celebration. Also make Great Stocking Stuffers! The Airing of Grievances 12 pack comes packaged in a Festive (pun intended) Reflective Silver Pillow Package - which resembles a portion of a Festivus PoleTM. 3" x 4"; each sheet is imprinted with the text "Airing of Grievance Notes (oh how you have disappointed me...)" as well as listing the Deskivus website and boasting a Deskivus Pole down the left side for FLAIR. Makes a Great Gift with or without a Deskivus Pole. 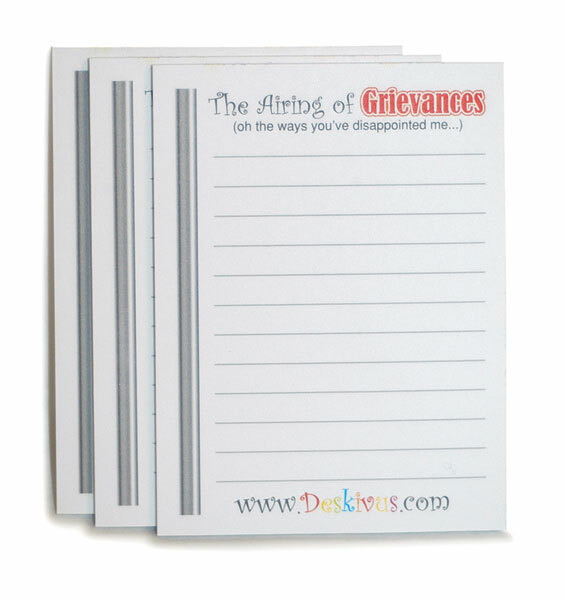 Each Official Deskivus(TM) ships with our Deskivus(TM) Festivus booklet and a pack of our "Airing of Grievances" Sticky Notes to assist you in telling all your friends, family and co-workers how they have disappointed you over the past year.